This week I had some tired days. When I asked my guides/angels about this I was told to rest. They were making me feel tired because I changing so much, and needed to slow down to adapt. They promised that they would take away the tiredness, but if I didn’t slow down it would have to return in double. So I promptly went to nap, and haven’t had the extreme tiredness since. 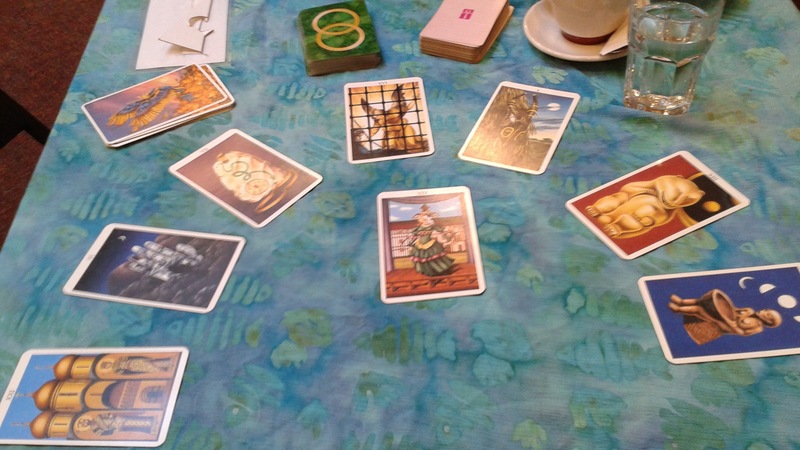 Then I came across a Tarot Card Reader. I was interested in the question of Traditional employment (ie Office Job) or less Traditional. The answer was that, if I decided to take Traditional employment for stability, it didn’t mean I’d be there forever. The main importance is that the job support my creativity. Even if it is waiting till I come home to do creative work. It is important that I listen to my inner child, and heal it. Whatever path I choose, I will be supported. In the end, I will end up in a creative job. Also that I need to talk with my less traditional sister, Sunshine about it. It was suggested that I write little bits at a time, and in the end I just might discover that it all goes together. There were other parts to the reading about growth, and mystery. The Moon kept on appearing in my cards. I really do not have a profound new insight to explore this week. At the cash register of the store I pulled the patience card. I think that it is the theme of my week. It is time to have patience and grow. This week was about taking in nutrients from experiences and teachings. I have been having a little trouble falling asleep, and my rest hasn’t been as deep. I have a few side effects from my thyroid medication, and was considering changing to a new one. Then I wondered if changing my diet just a little bit would help. We shall see what my Doctor recommends. This Doctor might have more advice then my old one, as they were upset to hear my old Doctor hadn’t regularly checked my T3 levels. They also mentioned a special location that deal with this kind of medication, and getting things right.